Your car has a speedometer that measures how fast you are going. An airplane has an air speed indicator, altimeter, artificial horizon instrument and other tools that the pilot uses to measure the aircraft’s performance. 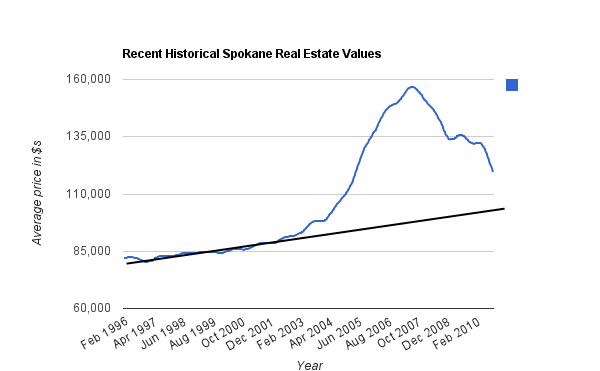 Think of this web site as a “speedometer” for the Spokane economy. Since the economy is complex, it has many dials and meters. The charts on this web site are the instruments measuring the performance of the Spokane economy and its people. The instruments currently show Spokane’s economy is running low on fuel and the engine is running a bit rough. The data I began collecting about Spokane’s economy back in early 2009 surprised me – and more recently, shocked me. It may shock you too. What I found has changed my view of what I thought I knew about Spokane. The reality is not the rosy picture presented by local promoters, politicians and business leaders. I read through about 20 years of economic development plans, each of which made the same observations and basically the same recommendations. Everyone apparently knows these issues but few want to talk about them. Larger versions of these charts are available in the various posts on this web site. Please use the Search box at upper left to search this web site. 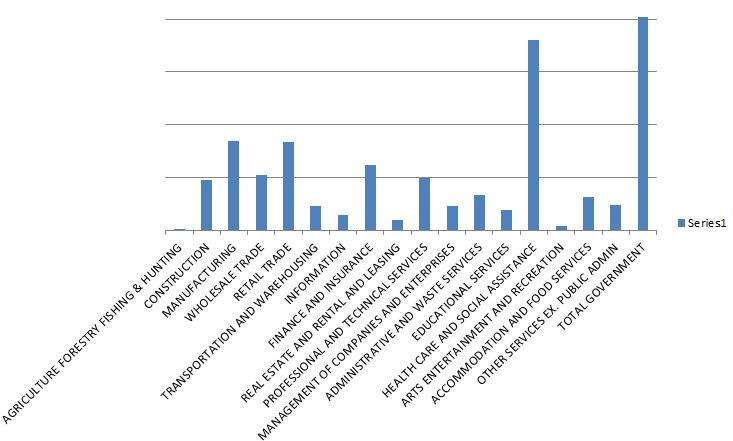 About 400 articles on economic and demographic data for Spokane as of early 2011! 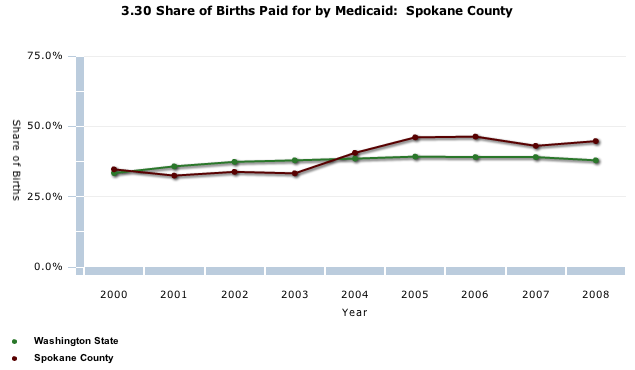 Spokane’s rate of 38% compares to 53% for the entire State. East Valley High School is at 29%. (Update: The latest figure is 36%). 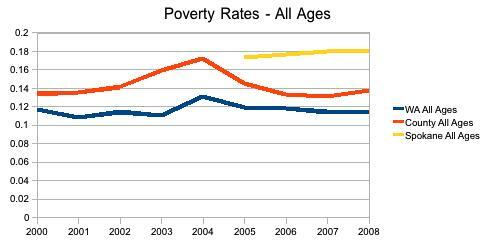 The Poverty rate is worsening – yellow and red lines going up while the state, blue line, is going down. Wages are low for most workers not working for government, health care or education. 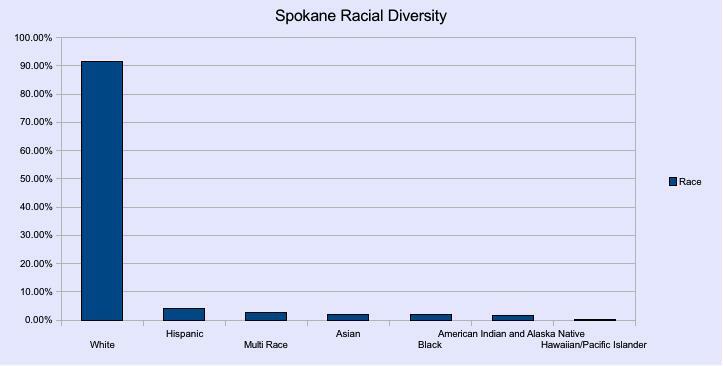 I recently drew this chart in a different way to make the non-diverse economy apparent – we have just two clusters in Spokane: Government and health care. Click on the chart to see an enlarged version. In 2004, you could fly to 16 cities non-stop from Spokane – in 2010, you can only reach 12 cities 2011, you can reach 10 cities year round and 11 (Chicago) “in season”. A loss of non-stop air services reduces the areas attractiveness to regional and larger businesses. Dozens of high tech and manufacturing companies have closed or sharply curtailed their Spokane operations during the first decade of the 21st century. Innovation has fallen as patent production per 100,000 population has fallen by a staggering -75% since 1998. College education in technology and science is minuscule in Spokane – and graduate education in technology, engineering and science is nearly non-existent in Spokane. This does not bode well for reversing the drop off in local innovation. Crime is higher than the rest of the state. The above chart – and the one that follow – are perhaps the two most important charts on this web site. The above captures in a single view the effect of decades of failed economic plans and strategies for the local area as we see that wages rise twice as fast everywhere else. Subtract out the government and health care workforce and we’d see that life for everyone else in Spokane is tough. Home prices have dropped in many parts of the country – Spokane is not immune. 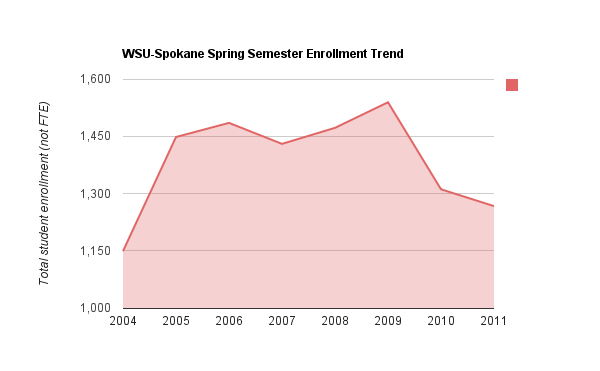 Enrollment at WSU-Spokane fell by 17.6% from Spring 2009 to Spring 2011 and is the only campus to have gone down in enrollment. 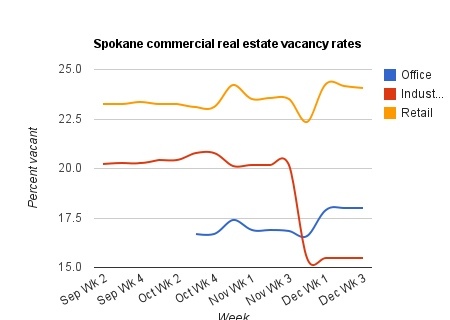 As of the end of 2010, Commercial real estate vacancies are high (I no longer update this chart because I spotted errors in the way the data source collects its data). Collectively, this paints a portrait of Spokane that has stalled and falling behind communities that show the opposite profile – increasing air traffic, more patents, declining poverty rate, fewer high school drop outs, more college bound youth and so on. This blog is about Spokane as it is rather than a web site about Spokane as we wish it would be – hence “raw and uncensored”. We can not pursue solutions until we first accept that there is a problem and that the status quo needs to change. This blog mostly says what people here already know – just read the comments to Spokesman-Review articles about the economy, jobs, schools, housing and so on. Like this comment in June 2010. Amazing. And no, I did not write it. The promoters and government leaders know what is presented here. All of the data on this web site comes from public reports available on public web sites. 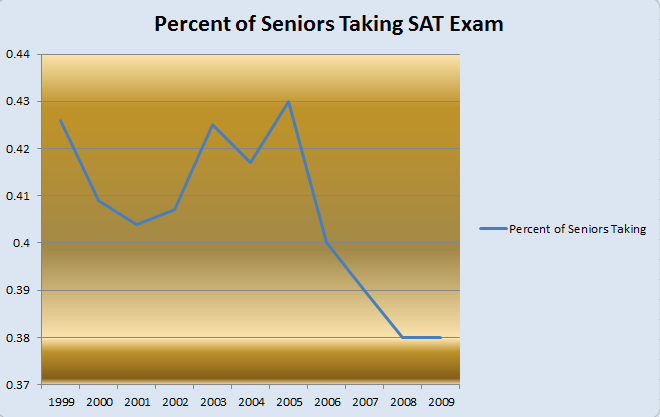 And many, going back a decade, show the same the same things, even including similar charts and citing the same data. I am surprised that local politicians, local business leaders, the leadership of Greater Spokane, Inc, are not screaming about what has happened to Spokane. There is no way to politely say this – the portrait painted by the economic data is ugly and dismal. And its not due to just the national recession/near depression but has been going on for a long time. In early 2009, I was curious as to what had happened to the high tech and manufacturing businesses we had in Spokane a few years ago. What happened to them and why had they left Spokane? I found my answer – off shoring, mostly – and began a hobby of tracking down bits of data about Spokane. Consequently, this is a hobby web site that collects much of what I learned in 2009 and 2010. 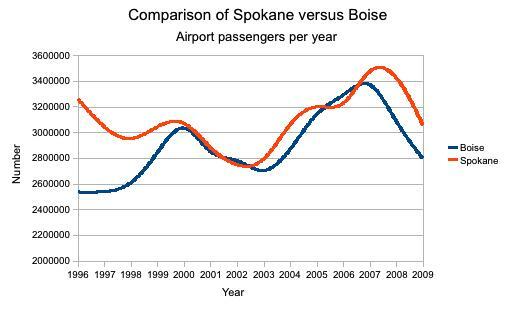 When I ran across the Spokane Airport data showing current annual passenger loadings lower than in 1996, I thought this collected information should be shared. Several friends urged me to put this information on line. I do not know how long I will keep posting here – as of 2011, I have reduced my involvement. There may be better quality data sources, there could be data transcription errors. If you find an error, please post a comment with reference to the correct data source. I tracked down about 13,000 job losses (of an estimated 20,000 total since 2001) and about 70% of them were due to off shoring work. During previous recessions, national corporations sought to reduce their costs. One way they could do that was to move their manufacturing and related design engineering to a lower cost city some where in the U.S. – like Spokane. 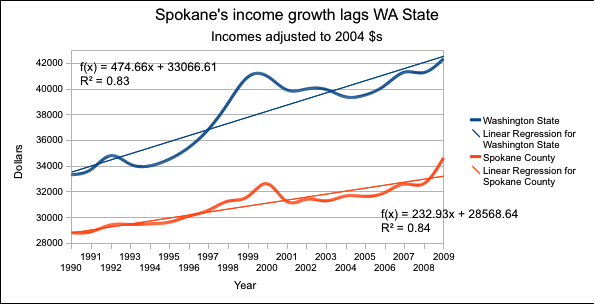 Recessions benefited cities like Spokane. 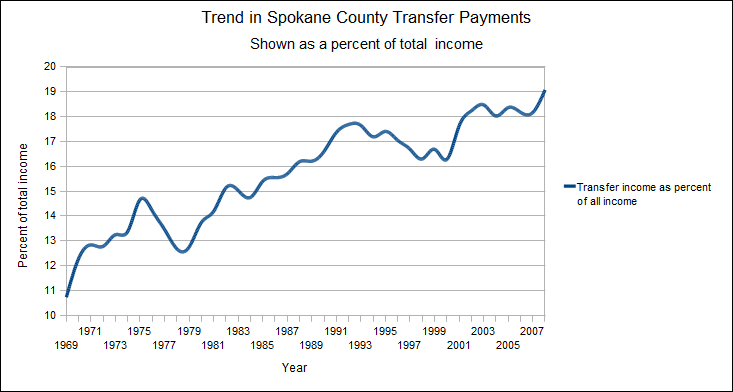 By 2001, as a new recession took hold, national and world-class companies had a new option – moving jobs outside the U.S.
Consequently, the low cost of living in Spokane and its low wages, which were marketed (and still are) as benefits of moving to Spokane were now usurped by cheaper locations off shore. Unfortunately, when your main competitive advantage is low wages you eventually lose out to some place cheaper. Spokane is a not a culture of ambitious people. Spokane is where people come to enjoy the mountains or retire to a slower pace (or as a commenter put it “a no pace”) lifestyle. If you are young and ambitious, or older and ambitious, some past and current residents would recommend you head to a coastal city like Portland/Vancouver or the Seattle area. Those cities have opportunities and high wages – and a demand for ambitious, highly educated or highly skilled workers. Spokane’s industry has surprisingly little demand for the highly educated. In the first few weeks of this web site, I was not anonymous. But several people suggested I should make it anonymous as it adds to the intrigue of what the data show. After several months, I was again going to post some background, but again, friends said keeping it anonymous would be better. Besides – the data itself is the story, not the personalities. Let’s stay focused on the data. The data matter – it doesn’t matter one iota who I am. I think there are at least two dozen people who know that I created the web site, so it is hardly super secret. People have contacted me and I have met some of you – thank you for great ideas and conversation. 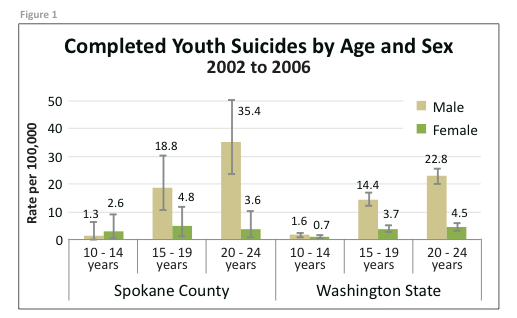 Unless we address this situation, Spokane will not get back on track. Instead, Spokane will muddle through like it has for a long time – always dreaming that the next big thing is around the corner. Spokane is destined for a future of government/health care/education (GHE) jobs and everyone else earning low wages in the (mostly) service sector – the whole community has turned into a service economy. Those in GHE won’t understand or see what the fuss is about – they mostly make west side wages while everyone else earns 20% to as much as 40% less. For some, Spokane literally is paradise – the GHE group has comparable west side wages and enjoys Spokane’s low traffic and outdoors lifestyle. The past history of previous economic strategies suggests change here seems impossible. See the links to the history of Spokane economic planning at the upper right of these pages. 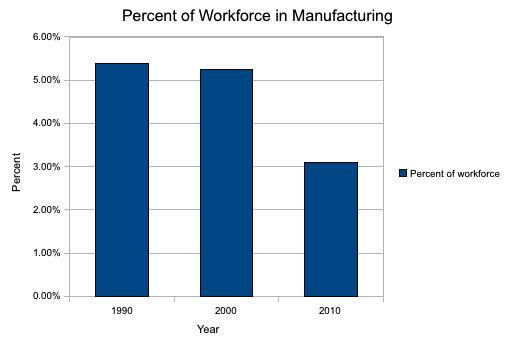 I had no preconceived conclusion when I began looking in to the disappearing manufacturing and technology companies. What I found is that Spokane is an historically low wage community that has been that way for decades and will remain that way (unless you work for the government, health care or education sectors). After decades of supposedly trying, few things change. Why? I am not sure. We cannot fix something that is broken until we diagnose the problems. This web site has evolved into a problem description with some suggestions for fixing the problem; however, as I learned in the history of Spokane economic development plans – all the reports have said the same thing, mostly made the same recommendations, yet after 20 to 30 years, little changes.